When you buy products from us through the checkout process on this website you are agreeing to be bound by these Terms & Conditions. You are responsible for providing the information we need to process your order. Peonies of Martinborough Limited (Peonies) is located in New Zealand and therefore must comply with all relevant New Zealand Laws. 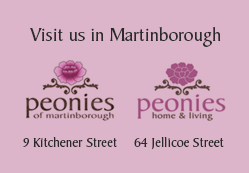 You can contact us through info@peoniesofmartinborough.co.nz or via further details on the contacts page. “Peonies Limited” will appear on cardholder statements for any credit card transactions made through this website. Your account will be charged in New Zealand dollars. All prices on this site are in New Zealand dollars and include GST (currently at 15%). The cost of any purchases, including delivery charges, are payable in New Zealand dollars (NZD). All prices and delivery charges within New Zealand are inclusive of New Zealand Goods and Services Tax. All payments are due at the time you order and we will not ship any goods until payment has been received. All of our online transactions are hosted by Payment Express. Payment Express is the largest Payment gateway in Australasia and is fully certified as Visa AIS and Mastercard SDP (PCI DSS) Compliant. We are totally committed to protecting the security and privacy of any personal information you supply in the course of purchasing from us. However, we take no responsibility for any malware caught from accessing our website. When you use our site, we receive and collect certain information in the course of the transaction which we use to complete your order and monitor our sales. We will never pass on any of your details to any third party. All orders are subject to the availability of the products you want to buy. There may be times when we have run out of products before we have had time to alter the website, or we have stock that differs from that on the website. In that case, we will contact you to discuss your order. We reserve the right to accept, reject or cancel any order, or part of an order, at anytime during the process. If we reject or cancel an order, we will refund any money you have paid in relation to the rejected part of the order, less any actual and reasonable costs we may have incurred on your behalf in trying to fill the order. You may cancel your order or part of an order anytime until payment has been processed and the order packed for shipping. Cancellations will be handled on a case by case basis at our discretion. If you think any goods are unsatisfactory, a written explanation needs to be emailed to us before we can consider a refund. Requests for refunds will be looked at on a case by case basis and any refund is at our discretion. Any complaints about our products should be sent to us in writing. We will look into your complaint carefully and will notify you of the outcome. Once your order has been placed and payment made, we will endeavour to process it the next working day. However, we cannot be held responsible for late delivery due to circumstances beyond our control, such as extreme weather conditions, strikes or shortages. The purchaser is responsible for paying shipping costs as notified on our website at time of purchase. It is the purchasers responsibility to provide an accurate delivery address. Sorry, but we are unable to ship to PO Box addresses. We make every effort to pack your order carefully. Peonies Home and Living have no control over the timing of your delivery and accept no liability for the timing , loss or damage to your parcel whilst in the hands of the courier. All our packages are sent through New Zealand Post (magazines only), or by Fastway Couriers. We will email you with a tracking number confirming the dispatch of your order. Please allow up to 10 working days for delivery of your parcel. If your parcel does not arrive within the expected delivery timeframe, please email us. We will lodge an enquiry for you with the relevant postal service. The postal service will then contact you with an update and details on how you can make a claim if necessary. At this time we are unable to post internationally. Title to products remains with Peonies Limited until such time as the products are paid for in full. Other than provided for under the Consumer Guarantees Act 1993, risk in products will transfer to you when such products are handed over to a delivery (e.g., courier) agent. For example, risk passes to you when your purchase is picked up by a courier or its agent, or possession is handed to a courier or its agent. Peonies Limited provides no warranties, whether express or implied, that information provided on this website is accurate or reliable. Peonies Limited provides no warranties of fitness or timeliness for a particular purpose or that this web site is merchantable. Your use of this web site indicates your assumption of the risk that it may contain errors. This site is provided by Peonies Limited on an ‘as is’ and ‘as available’ basis. Peonies Limited makes no representations or warranties of any kind, express or implied, as to the operation of this site or the information, content, materials, or products included on this site. You expressly agree that your use of this site is at your sole risk. To the full extent permissible by applicable law, Peonies Limited disclaims all warranties, express or implied, including, but not limited to, implied warranties of merchantability and fitness for a particular purpose. Peonies Limited does not warrant that this site, its servers, or e-mail sent from Peonies Limited are free of viruses or other harmful components. Peonies Limited will not be liable for any damages of any kind arising from the use of this site, including, but not limited to direct, indirect, incidental, punitive, and consequential damages. You agree, that if you are purchasing from peonieshomeandliving.co.nz on behalf of a business the Consumers Guarantees Act 1993 does not apply. By visiting or shopping at peonieshomeandliving.co.nz you agree that New Zealand laws apply. Peonies Limited may, from time to time, add or remove information or products from this website without notice. We reserve the right to amend these Terms & Conditions at any time without notice, and we may terminate your access to this website at any time without notice. As this site operates in a changing commercial, technological and regulatory environment, we may amend these terms and conditions from time to time. You are responsible for ensuring you are familiar with the latest terms and conditions. Your continued use of this site represents your agreement to be bound by the terms and conditions as amended. Where your access to this site is terminated, all disclaimers and limitations of liability set out in these Terms & Conditions will survive. These terms and conditions were last updated 17th February 2016..